The Carrier Priority Card Program is a purchasing program designed specifically to meet the needs of customers and dealers. For customers, the program offers consolidated billing; guaranteed, not-to-exceed pricing and parts rebates. From zero credit risk, reduced overhead to online account access, the Carrier Priority Card program offers dealers many outstanding benefits as well. Convenient 24/7 credit and expert service at Carrier Transicold dealers located across the United States and Canada. 2% rebate credit on all Carrier Transicold parts purchases, applied automatically to your billing statement. Instant credit to your line of credit at any Carrier Transicold dealer, USA and Canada 24/7. Low fee. All you pay is a transaction fee of 0.5% to enjoy all the benefits of the card. Consolidated reporting and billing statements streamline your recordkeeping and help reduce administrative costs. 24/7 access to online account information such as billing statements, account information and detailed transaction data. To sign up for a new Priority Gold Card account, call 1-866-ROADCARE (1-866-762-3227). If you are already a Priority Card cardholder, you can convert to the Priority Gold Card by calling 1-866-ROADCARE (1-866-762-3227). 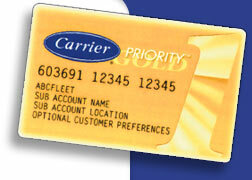 To request online account access you must be an existing Carrier Priority Card or Priority Gold customer. 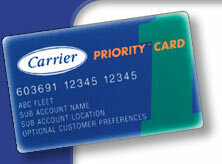 To request online account access you must be an existing Carrier Priority Card Dealer.